Das Deutsche Haus was constructed in Indianapolis, IN from 1893-1898. The architectural style was German Renaissance Revival. The German-American architects of record were Bernard Vonnegut and Arthur Bohn. This new facility hosted many organizations, including Socialer Turnverein, Normal College of the North American Gymnastic Union, Maennerchor the German-American Veterans Society, the German-American School Society, the Social Turnvere in Women’s Club and the German Ladies’ Aid Society. By the turn of the century it represented the pinnacle of Indianapolis’ German-American culture. Times drastically changed when the United States entered World War I. Anti-German-American hatred was nationwide and pressure was put on the Turnverein of the Das Deutsche Haus to change its name. 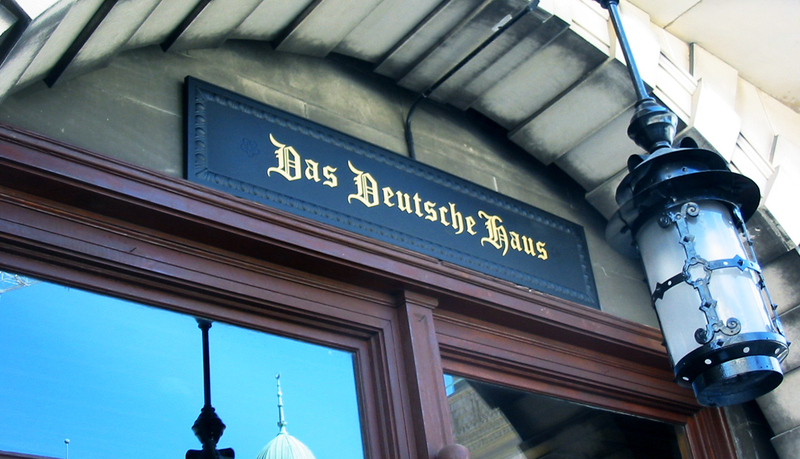 On February 22, 1918 the members of the Turnverein formally retired the name Das Deutsche Haus and publicly announced The Athenaeum. It was a Latin name, not a German word. 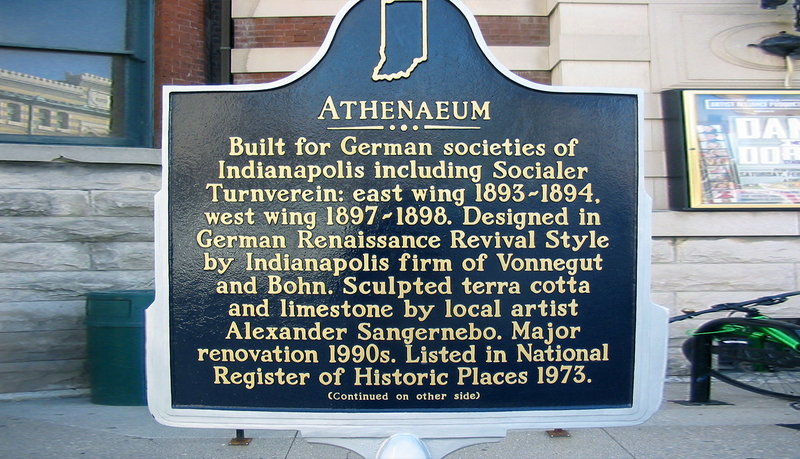 The Athenaeum (Das Deutsche Haus) was added to the National Register of Historic places in 1973 and designated a National Historic Landmark in 2016. 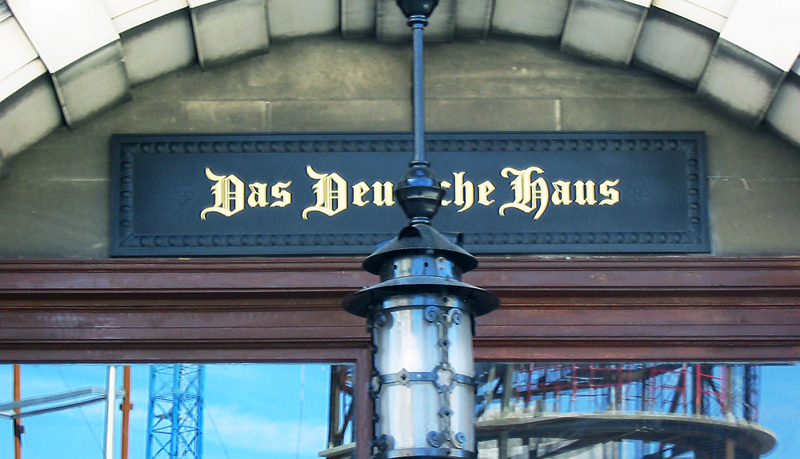 One of the architectural elements of the original Das Deutsche Haus was its beautiful ornate sign. From archived photos, the sign looked to be a rectangular cast iron plaque with egg and dart border with rosettes. The location of this original sign is still unknown but on February 22, 1918 a temporary sign reading “ATHENAEVM” covered the original plaque. It was followed with an inscribed limestone tablet that has been there ever since. 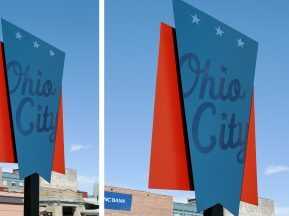 The client decided in 2017 that it was necessary to honor the original sign from 1898 by recreating that sign. 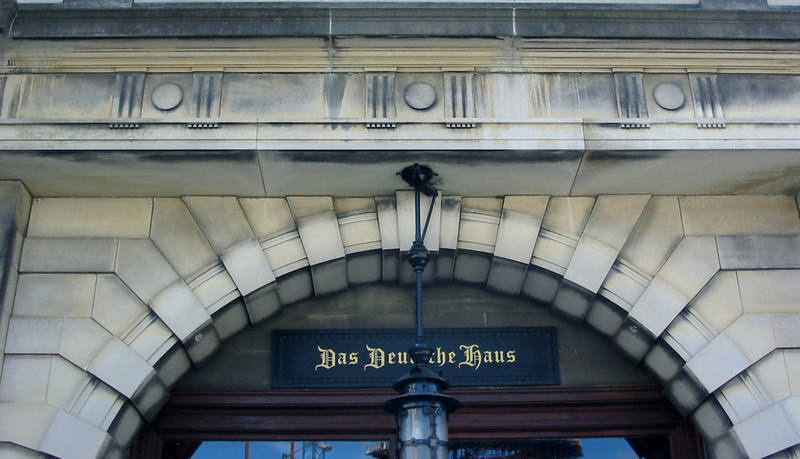 In November of 2017 the Indiana German Heritage Society decided to install a 1/2 scale version of the original Das Deutsche Haus sign. They were planning a dedication ceremony for February 22, 2018, exactly 100 years after the name changed. 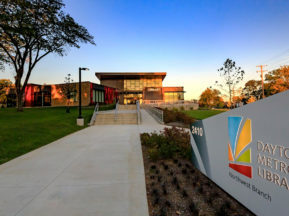 They solicited bids from signage vendors, who could meet their requirements, and chose ASI. Several consultations with the client occurred. The use of Cast Bronze, Cast Aluminum and etched materials was discussed. 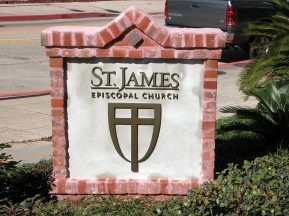 The client wanted a close resemblance of the material used to make the original sign. They decided on Cast Aluminum, mainly because of the weight. The plaque incorporates an egg and dart, sculpted border, dimensional rosettes and custom artwork lettering. The color scheme is Matte Black with Metallic Gold lettering. 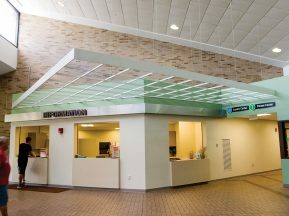 The client had a definite budget and timeline for completion and ASI accomplished both requirements. The client had special mounting issues that had to be met. They wanted only four (4) penetrations into the building. The concealed stud locations needed to be exact so as to penetrate only the mortar joints. Also, there was an existing electrical conduit directly behind the plaque. The solution was to space the plaque off the wall. Again, ASI successfully overcame all the challenges.